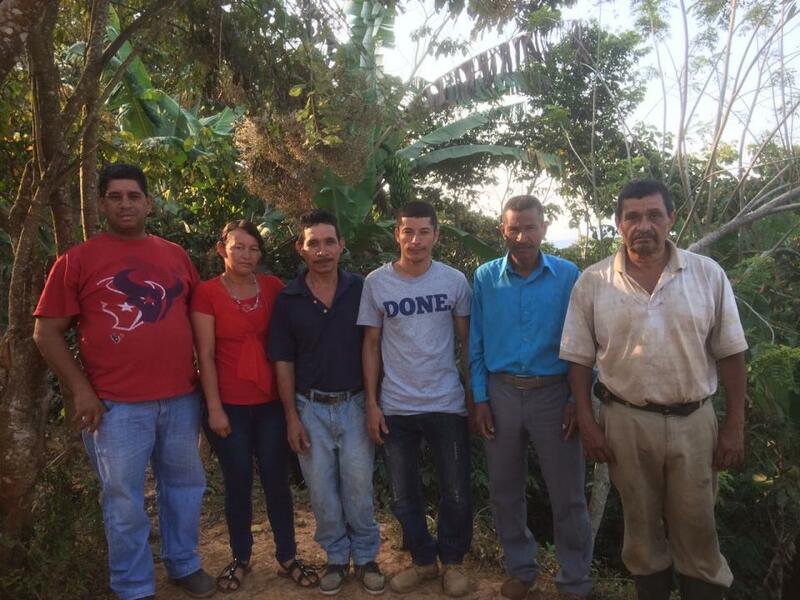 A loan of $2,825 helped a member to purchase manure, fertilizers and pay for weeding his coffee crop. Jose is 57 years old, married, has three children, and lives with his wife and children in the municipality of Morazan, Yoro. He has always worked in agriculture and has had his own crops for over 11 years. He has always harvested corn, beans, and coffee. Currently, his greatest yield and sales is of coffee which he sells in the local market. He asks for his first loan, as a group loan, to purchase manure, fertilizers and pay for weeding his coffee crop and give it good care. His idea is to help his children and continue with coffee growing. Jose belongs to the group called the Productor Nueva Vista solidarity group, which is formed of 6 members, they all live in the same community and work in agriculture. The group loan is for 66,000 lempiras which they will invest in the purchase of manure, fertilizers and pay for weeding their coffee crops. In the photo they are identified as: from left to right Marlon, Iris, Jose Rufino, Jose Daniel, Jose Santos, and Jose de la Paz. Jose, tiene 57 años de edad, es casado, tiene tres hijos y vive con su esposa y sus hijos en el municipio de Morazan, Yoro. Él siempre se ha dedicado a la agricultura y tiene más de 11 años de tener sus propios cultivos. Siempre ha cosechado maíz, frijoles y café. Actualmente su mayor producción y venta es de café que vende en el mercado local. Solicita su primer préstamo en forma grupal para comprar abonos, fertilizantes y pagar limpieza para su cultivo de café y darle buena asistencia. Su idea es ayudar a sus hijos y continuar con el cultivo de cafe. Jose pertenece al grupo llamado G.S. Productor Nueva vista, que está formado por 6 miembros, todos viven en la misma comunidad y se dedican a la agricultura. El préstamo grupal es por 66,000 Lempiras que los invertirán en la compra de abonos, fertilizantes y pago de limpieza para el cultivo de café. En la foto se identifican así: a la izquierda Marlon, Iris, Jose Rufino, Jose Daniel, Jose Santos y Jose de la Paz a la derecha. It allows smallholder farmers to purchase inputs to improve yields on favorable terms. This loan enables smallholder farmers to invest in their farm's production. It is offered at a below-market interest rate and with flexible repayment terms that accommodate the seasonal cash flows of farmers. By supporting this loan, you are helping smallholder farmers increase production and improve their standard of living. This loan is administered by Organización de Desarrollo Empresarial Femenino Financiera, S.A. (ODEF), a Kiva Field Partner in Honduras. A leader in the microfinance sector since 1985, ODEF strives to combat poverty by offering a wide array of financial services to low-income men and women. The organization works with its parent NGO, ODEF OPD, to provide training and technical assistance to impoverished microentrepreneurs. By incorporating the entire family unit in this process, ODEF OPD aims to improve the standard of living through the creation of profitable enterprises. Visit ODEF’s partner page for more information. ODEF has long been a leader in Honduran microfinance, and currently offers borrowers throughout northwestern Honduras access to a broad range of savings, loan, and insurance products, as well as remittance and bill payment services. ODEF Financiera was interested in partnering with Kiva to fund several existing innovative loan projects targeting underserved populations: a loan program for Afro-Caribbean Garifuna women affected by HIV/AIDS, and loans to serve rural populations living in extreme poverty in the department of Lempira. Kiva has chosen to partner with ODEF to support these costly but socially valuable loan programs, and we look forward to helping ODEF further develop or expand these programs in the future.